Your Weekly Food and Drink Wrap: Positive Press Gone Wrong? The biggest food story of the week didn’t originate in Portland, or this week. In November of last year, Thrillist writer Kevin Alexander published his account of visiting 30 cities to devour 330 burgers to see which burger reigned supreme in all these United States. His top pick? Our very own Stanich’s. Today, though, he offered a mea culpa, realizing that lists like his can damage businesses more than help. Need proof? Stanich’s closed six months after that list was published and there are no signs that it will open again soon—or ever at all. But the real judgement rests on all our specific shoulders, because it was us—and our unforgiving expectations—that ultimately killed a small thing we loved most. In other news, the Mercury reported that employees at the Burgerville on Hawthorne delivered a petition to its managers initiating its intent to unionize. Three down, 44 to go. In other other news, the O hung with Bollywood Theater’s Troy MacLarty, who’s opening Churchgate Station, a 40-seat weekend night Indian-inspired supper club behind Bollywood’s Division Street digs. Expect seasonal ingredients, more sweets, a possible biryani night, and maybe even weekend brunches. PoMo swung by La Neta, the Mexican-inspired Johnny Leach-run restaurant anchoring the ground floor at the newly opened Hoxton hotel in Old Town-Chinatown. The breakfast/lunch/dinner spot will feature takes and mash-ups on Mexican classics like Caesar salads and chilaquiles. The glossy also indicated that Leach will be in charge of Tope, the Hoxton’s rooftop taqueria and cocktail club. Yum. Willamette Week was busy, dropping its food guide while showcasing Master Kong, the weekly’s 2018 “newcomer of the year,” and Gabriel Rucker’s Canard (which is “exactly as if fast food got a Michelin-star upgrade”), the paper’s “best spinoff” of 2018. The weekly also took time to review the new Vietnamese restaurant XinhXinh (where the avocado milkshake is a breakout star), to report that Reo’s Ribs is open and back in the barbecue game on Sandy, and that a former Cha Cha Cha employee is seeking more than $800,000 in damages for “sexual harassment, unpaid wages, and wrongful termination” because men are trash. Allegedly. Finally, Eater reported that Bar Rione, a new bar and quasi-waiting room for the adjacent Piazza Italia, is now open in the Pearl. Also open in the Pearl? Robbie Wilson’s gin-soaked Botanist cocktail bar. The folks behind Dame are opening a new bottle shop in their private dining room called, well, Dame Bottle Shop. The site broke the bad news that the gluten-free vegan wafflry—yes wafflry!—A Little Nectar is turning off its light in Lents this Sunday, and noted that Janis Martin’s seafood-centric sake bar Tanuki has temporarily closed due to Martin’s adult-onset seafood allergy, indicating that it will reopen in December, although there are no new plans for what a new Tanuki menu might look like—or even that it will have a menu at all. 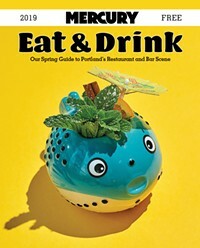 Buried in the story is this compelling gem: Martin has been allergic to shellfish during her entire tenure at Tanuki. That. Is. Nuts.